Recently Kevin Rose redirected his eponymous domain to his Google+ profile, reflecting that "G+ gives me more (real-time) feedback and engagement than my blog ever did." Earlier this year Steve Rubel deleted thousands of blog posts from older TypePad and Posterous sites, and started afresh on Tumblr. Moving the center of one's online presence to "where the action is" is not a new phenomena. 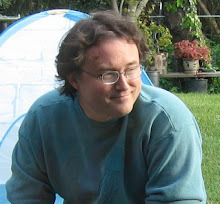 In 2008 Robert Scoble essentially abandoned his own sites in order to spend time on Friendfeed, the hot new social networking site at that time. Techcrunch even attempted an intervention over the move. After the Facebook acquisition of FriendFeed the site gradually decayed through benign neglect. Scobleizer moved on long ago. Why do this? Surely its better to own your own domain and control your destiny? Or is it. In this discussion we'll focus on people who are online for more than just casual interaction or journaling, who have specific goals they are trying to accomplish with their online presence. Essayists publish thoughtful prose, focussed on a particular topic. Presentation and style is important, but generally secondary to the density of ideas within. The product of their labor comes slowly, and is intended to stand for considerable time. Orators can also deliver thoughtful ideas and spend considerable time preparing for it, but the dynamics are very different. The pace is faster, the interaction more frequent with less time to consider. The delivery and ideas can be adjusted over time, with each new presentation. Translated to their online equivalents, I think we can still recognize the Essayist and Orator archetypes based on what they want people to find when they search. The world is a larger place now, when we want to know something outside of our knowledge we search for it. For an Essayist, the desired result is a post with thoughts on the topic, linked to their name. For an Orator, the desired result is a conclusion that the orator is knowledgeable about the topic. For an Essayist its important to keep material available for people to find, and in a form which links back to the author. Considerable effort has been spent to provide value up front. If someone needs more they can contact the author, who can provide additional help freely or with suitable compensation. Hosting on one's own site allows the linking of authorship to original material, and provides a stable contact point. For an Orator, its more important that people find the author's name as someone knowledgeable about the topic. An Orator seeks contact much earlier in the process than an Essayist. They want a followup search to be for their name, to find out how to contact them. This desire for contact earlier in the process implies that the Orator will interact freely on many topics. At some point, if the searcher becomes convinced they can benefit from the Orator's expertise, they may discuss terms for further help. For an Orator, its less important to have a stable presence online. The desired result is for someone to seek them out personally, and even if they move from one site to another search engines can be depended on to find their most recent incarnation. I suspect this categorization paints with too broad a brush, as no one corresponds exactly to either archetype, but I'm finding it useful to consider. 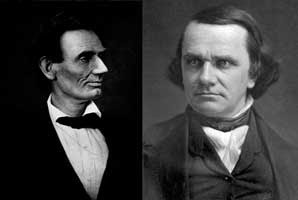 Lincoln and Douglas pictures courtesy Wikimedia Commons. Both are in the public domain in the United States.